If you haven't checked the 'Recommended' section of our website lately, we've added a few more of our favorite things that we love to share. 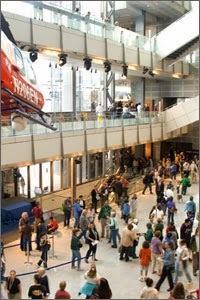 A Do-Not-Miss Site in Washington: The Newseum (www.newseum.org). It may be the world's only museum focused on journalism, and it's a winner. It covers the history of communications media, its evolution into the electronic and digital eras and its impact on U.S. history and politics. For anyone with the least interest in communications, it's easily worth a half-day stop - and you'll probably want to come back for more. You may think you get too many emails every morning, but we're betting that you'll add one more - the daily offering from Delanceyplace (www.delanceyplace.com). Every weekday it sends out a brief excerpt from a nonfiction book. It may be old or new; history, philosophy, biography, politics; from a famous book or an unknown one – but it is always interesting, and usually fascinating. Where did the term ‘white collar’ come from? Why did the American Revolution actually begin in 1763? How was Albert Einstein not just the father of nuclear energy, but also of solar power? You’ll find a tidbit like that every morning. Restaurant: One of our favorites anywhere is Rasika (www.rasikarestaurant.com), both in Penn Quarter, just off 7th Street NW, and in the West End, on New Hampshire just off M Street NW (and way too close to our office). You may think you've had Indian food, but nothing like this. Modern, amazingly creative dishes in a sleek high-tech setting. The crispy spinach alone is worth a trip to DC. Come see us and we'll introduce you.